(Newser) – There are good friends and then there's Cato Larsen of Norway. 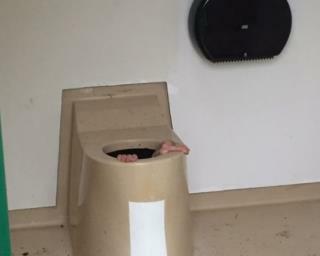 The 20-year-old climbed into the tank of an outdoor toilet Friday after his friend dropped his cellphone into it, AFP reports. According to VG, the friends decided Larsen was the only one skinny enough to get into the toilet and retrieve the phone. "Slim enough to get into it, but not slim enough to get out," Larsen clarifies. He found himself standing thigh-deep in excrement—the toilet is only emptied once per year—and unable to climb out. Larsen was, understandably, vomiting; in addition to the human waste, he says there were animals crawling on him. So I guess these idiots have never heard of a net. What a bunch of nincompoops! That guy just re-defined TWO words....friend, and stupid. So are we still going to party, or are you pooped?